﻿The Delft Rabbit is perfect for Easter, Spring and Year of the Rabbit too! The blue tones go with the colors of spring flowers. ​And the Bluebird is ideal for all-occasion Mother's Day, Easter, Birthday, Friendship and bird lovers in general for cards, crafts and small gifts and favors. The Delft Rabbit Wrap and Topper set and 3D Decorate It blank mug have been added to this combo! ​Delft Rabbit (save $6 on the combo). ​In the combined Rabbit and Blue Bird Combo you save a further $3 for a total of $13 over all the individual sets! 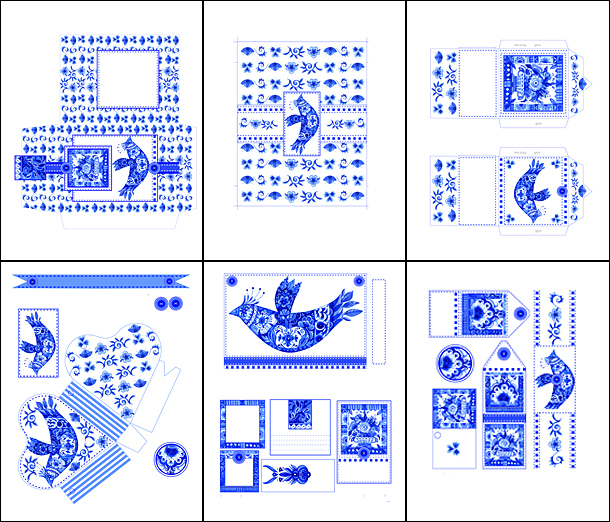 The Delft Bird and Delft Rabbit ranges consist of more than 40 pages. I love porcelain and pottery designs and often use them in my illustrations. I grew up in a home with beautiful blue and white porcelain and started my own china collection (but with black and white) designs when I was still studying. So I am creating craft ranges with china designs! 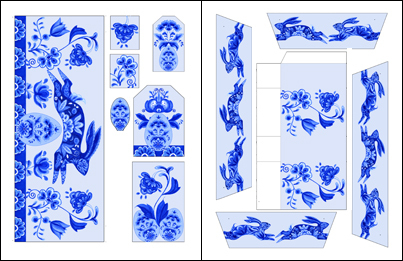 This range depicts Delft Blue pottery designs painted on an Anni Arts Bird and Easter Rabbit. The range includes cards, postcards, notelets and printables like labels, packets and wrappers. These designs are ideal for Mother's Day, Easter, Birthday or Friendship cards and for small gifts and favors. For bird and rabbit lovers too. The dimensional, layered card, envelope and bookmark is also available separately. Do you like the Delft series? Should I add items? Scroll down to comment ! 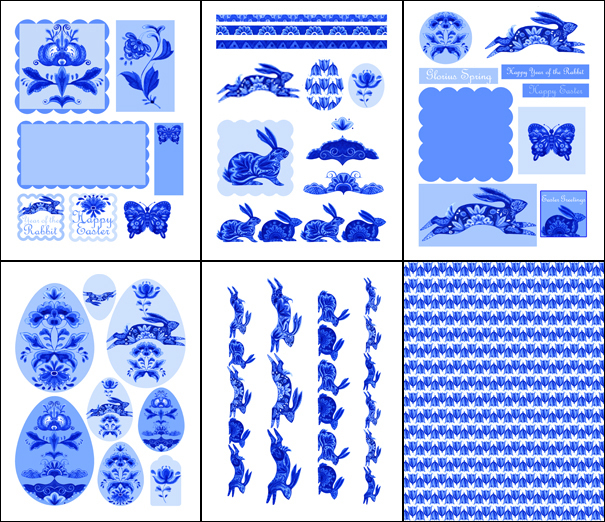 Delft Rabbit Wraps and Toppers have been added too! ADDED! Blank Decorate It 3D Mug! Note: In the individual sets the card kit and craft set both have multi-purpose tulip paper, but the combo has only one to avoid duplication. The Delft Rabbit card kit is crammed with toppers, borders, elements, egg shapes, tags and text sentiments featuring various Delft rabbits, blue flowers and butterflies. A tulip background pattern is included for backings or wrapping of small gifts. For Easter wishes and a great card for anyone born in the Year of the Rabbit too. Luxury Delft Rabbit crafts for Easter and Spring. There is a handbag for little Easter egg choccies or sweets, wraps for cupcakes for Easter tea, or for muffins for Easter breakfast, or use as egg cups for big choc eggs. Plus small cups for hen-egg sized eggs, a small size for smaller candy eggs with tags. And the Anni Arts 3D Easter egg in three designs for smart Easter decorating. Just add spring flowers! Note: Wrap and toppers only. Mug, packets and tray not included! 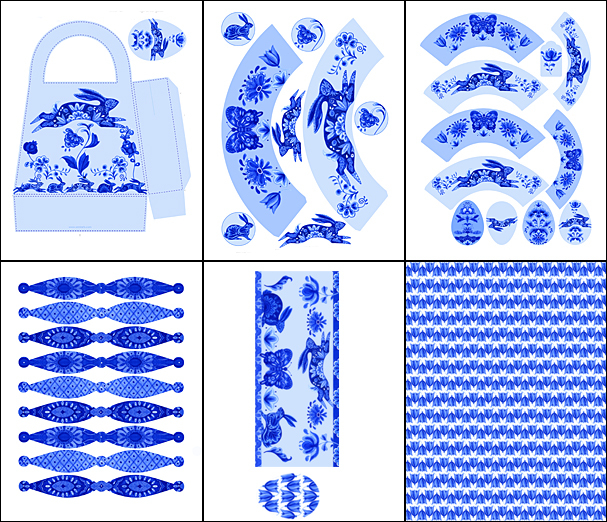 Eight Dark and Light Delft Blue Geo Pattern Pages are also included for coordinating crafts and wrapping!